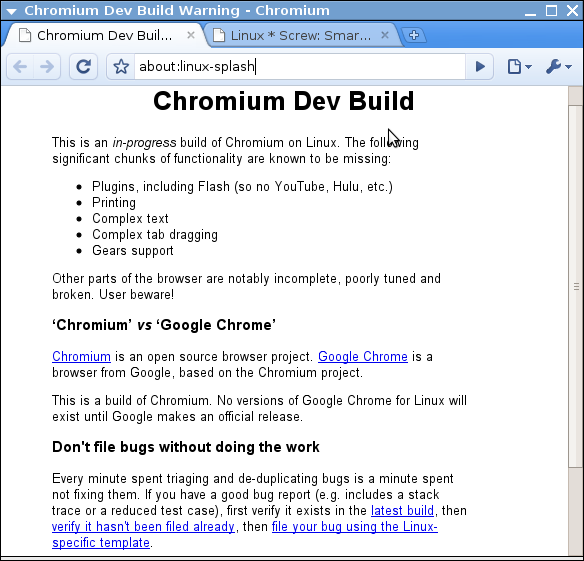 Install Google Chrome (Chromium) on Ubuntu Lucid Lynx. One of the easiest way to try Chromium browser in Ubuntu Linux (Google Chrome browser for Unix/Linux operating system is named as Chromium) is to use daily binary builds at https://launchpad.net/chromium-project. Today Ubuntu is the most popular Linux disributions for desktops so there are daily builds available for the following Ubuntu versions: hardy, intrepid, jaunty, karmic. Replace jaunty with hardy, intrepid or karmic depending which version you run at your computer. If you feel this information is not sufficient for you, follow this link to get Ubuntu official information on this matter or follow Launchpad help. Once you press enter Ubuntu will download around 18 MB of data from launchpad’s server and will install Chromium with gnome menu entries and shortcuts. Now you can go to System menu –> Internet –> Chromium Web Browser in order to launch Google browser. You might also find this page using Google and the following keywords: Ubuntu Chrome, Google Chrome Ubuntu, Chrome for Ubuntu and others. Information improvisation: Are you worried about http://www.braindumps.com/LX0-102.htm exam prep and http://www.pass4-sure.us/642-732-dumps.html practice test? Check out our latest resources for http://www.test-king.com/exams/70-462.htm and http://www.avaya.com/usa/ for practice with definite http://www.actualtests.com/exam-70-462.htm training. Have a excellent day!. Thought I would comment and say cool theme, did you code it for yourself? It’s really really good! Nice article. Also take a look at these of the best Photoshop video tutorials. Naturally I like your web-site, but you need to check the spelling on quite a few of your posts. A number of them are rife with spelling issues and I find it very troublesome to tell you. However I will surely come again again! Hi there. I discovered your website via Google even as looking for a similar matter, your web site got here up. It appears great. I've bookmarked it in my google bookmarks to visit later. Hiya, I am really glad I've found this information. Today bloggers publish only about gossip and net stuff and this is actually irritating. A good website with exciting content, that is what I need. Thank you for making this web site, and I will be visiting again. Do you do newsletters? I Can't find it. Great write-up. I’m a normal visitor of your blog and appreciate you taking the time to maintain the nice site. I will be a regular visitor for a long time. Thanx for a very interesting blog. What else may I get that kind of info written in such a perfect means? I've a mission that I'm simply now running on, and I have been at the look out for such information. I think other website owners should take this website as an model - very clean and excellent style and design, not to mention the content. You are an expert in this area! It’s truly a great and helpful piece of info. I’m satisfied that you shared this useful information with us. Please stay us informed like this. Thank you for sharing. Obviously I like your website, however you need to take a look at the spelling on quite a few of your posts. Several of them are rife with spelling issues and I find it very troublesome to inform you. On the other hand I’ll surely come again again! Hello there. I found your website by way of Google while searching for a similar matter, your website got here up. It seems to be great. I've bookmarked it in my google bookmarks to visit later. I was just seeking this info for some time. After six hours of continuous Googleing, finally I got it in your website. I wonder what is the Google's problem that doesn't rank this type of informative web sites closer to the top. Usually the top sites are full of garbage. seasoning you already have it in your meal. Green Lipped Mussel cooking, Check it out for your self. Hello very cool site!! Man .. Excellent .. Superb .. I'll bookmark your site and take the feeds additionally?I'm glad to find so many useful information right here in the post, we'd like work out more techniques in this regard, thanks for sharing. . . . . .
Did you legit use bots to generate your comments?